We came down to Lusaka from Kapiri Moshi after catching the TAZARA train from Tanzania. The train “only” took 65 hours, this was the fast train. The train journey was very pleasant with a cafe part where we could buy food and drinks, or we could order the food and it would be delivered to our cabin. The food was pretty terrible, so we bought a lot of food buy sticking out heads out of the windows when we drove past villages. We crossed the border between Tanzania and Zambia on the train and this was probaly the most luxury border crossing as they immidation officers entered the train and came into our cabin and we didn’t even have to get up. Once we arrived to Kapri Moshi we got on a chicken bus to Lusake which took around 3 hours and was one of the most uncomfortable bus rides we have ever been on to date. Arriving to Lusaka around 10pm and taxi drivers always try to take advantage of the darkness by hiking up their prices. Lusaka had some good sunday markets and feels like “real africa”. But aside from that we didn’t think there was a lot to do there as a backpacker that you couldn’t do better somewhere else. This town is pretty touristy as it’s the gateway town to the Victoria Falls in Zambia. In saying that, we really enjoyed it and there is a lot to do around the area. Even on the outskirts of town you can spot herds of elephants, zebras and crocodiles. Accommodation– We stayed at a Fawlty Towers which was good. We moved there from Livingstone backpackers, as we found Livingstone backpackers was nice but it was full of volunteers and they didn’t really mingle with the travellers, so the vibe was better at Fawlty Towers. Victoria falls is the largest waterfall in the world. Not to be confused with the highest waterfall in Venezuela, angel falls. Largest because it has the more water falling over the falls. Like with Iguazu Falls people always talk about which side of Victoria falls is better to see the falls from. 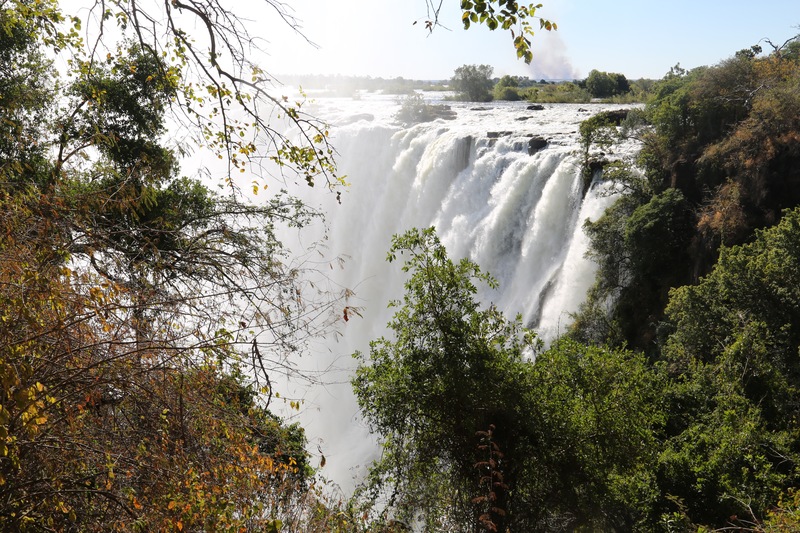 You can see more of the falls on the Zimbabwean side but you can do more extras on the Zambian side. I think if you could only choose one side then you would be better off going to the Zimbabwaen side.